Coming as it does between the startling inventions of Larks’ Tongues In Aspic, and the far-reaching repercussions of Red, when it comes to assessments of the King Crimson canon, Starless And Bible Black has often been overlooked. Yet even a cursory listen reveals this to be a powerful record, possessed with a buoyant, brimming confidence borne out of the band’s increasing mastery of the concert platform. Though the listening public wasn’t aware of it when it was originally released in March 1974, SABB was in essence largely a live album though its true nature was only revealed in the scrapbook of The Young Person’s Guide To King Crimson, some two years after the band had ceased to exist. Some live albums are celebratory affairs with the crowd very much part of the aural excitement. Yet with all traces of the audience carefully removed and edited, SABB was a strangely furtive documentary of the group operating in its natural element. In some respects, SABB can be seen as an experimental template, one which mingled live tracks with stand-alone studio tracks; one where concert performances were augmented with studio overdubs, and, in the case of The Mincer, adapting live improvisation in the studio to create wholly new material. Given that no other incarnation of King Crimson, before or since, played as many concerts as this particular line-up, perhaps the true nature of SABB should have been obvious all along. After all, hadn’t Fripp been standing at the microphone telling audiences that the band were recording gigs for possible inclusion on a new Crimson album during several European dates in October and November 1973? Assembled in the unlikely surroundings of the Richmond Athletic Ground’s clubhouse that August, a barely recovered Crimso began writing rehearsals. Having notched up 60 gigs between mid-March and the completion of a North American tour in May, it's no surprise that a degree of irritability and impatience crept into the proceedings. Crimson’s writing processes were “excruciating, teeth-pullingly difficult music-making” according to Bill Bruford. Finding the balance between live work and the time to write new material had always been a recurring source of tension within the band. For his part, while pleased that Fripp had turned up to rehearsals with new pieces to work on, Bruford would have preferred more pre-written material being presented in full, rather than trying to write things from scratch in the rehearsal rooms. "The tunes that Robert has written all the way through such as Fracture, these are good and, had there been greater output from Robert, we'd have got on quicker and faster. Robert's always done this. He's started off these bands with one-and-a-half tunes that point the general direction, and Fracture would have been one of them." A re-energised Crimson returned to the USA in September (during which time Fracture underwent various nips and tucks), arriving in Europe in mid-October. It was during this leg of the tour they began recording selected gigs with the express purpose of including some concert output on a planned album. With only three new compositions to a set-list that was largely based upon the still-current LTIA, collective improvisation remained a vital ingredient. Of course improvisation in rock music wasn’t confined to Crimson. Many bands placed a great deal of emphasis on extemporisation, though for the most part these revolved around individual soloing as the focal point, played across relatively stable chord progressions and beats to match. However, it was the near-telepathic levels of communication achieved in dynamic and complex in-flight sorties that took Crimson light years beyond blues-based vamping, and gave the group its distinguishing and defining feature. The stage was a place where they were able to exploit their uncanny ability with off-the-top-of-their-head pieces that sounded like tightly-drilled compositions. In sound checks, Bruford and Wetton would sometimes play riffs based on Herbie Hancock's 1971 album Crossings. "We were very impressed with American jazz-funk” explains Wetton. “What Herbie was doing and what Miles Davis was doing was using incredibly good players who could riff and that was a big influence on me and Bill. We brought that into the improvisations in a big way." Whether it’s the playful cat-and-mouse funk of We’ll Let You Know, (from Glasgow 23rd October), the delicate reflection of Trio or the thrilling gothic vista evoked by the title track, (from Amsterdam’s Concertgebouw recorded precisely one month later), Crimson when compared to its contemporaries was quite literally in a league of their own. The title track, which Wetton regards as one of their finest improvisations, Cross's role as texturalist as he skilfully utilises the Mellotron and electric piano to offer a palette of rich tones, generating a swirling mist through which Fripp’s laser-beam guitar eerily shines. He provides some striking contrasts in the early part of the piece via inventive use of the electric piano’s volume pedal, letting dark blotches of timbre bleed up underneath the radiant, swirling guitar. Utilising impressionistic moods, atonal elements, out-of-the-box rhythms, high-degree risk taking, and a monstrous rock sound, there was always a magical, mercurial dimension present in a King Crimson concert. You never quite knew what was going to happen next, and it’s this aspect of the band which is brilliantly captured on SABB. In January 1974 work began on assembling the follow-up album to Larks’ Tongues In Aspic at Air Studios. Over the course of two weeks, the studio tracks began taking their their final shape. The Great Deceiver, newly emerged from the sessions at Air, contained a Fripp lyric about the clash of commercialism and religion, as well as Richard Palmer-James reference to falafel-making rather than any homophobic inference which some listeners mistook it to be. John Wetton, whose confidence as a vocalist grew during the session, also overdub some uncredited electric guitar on the track. Though Doctor Diamond (aka Dr.D) had been in the set-list since 1973, and would carry over into the live set in 1974, no record exists that it was considered or even attempted for inclusion on this album or Red. 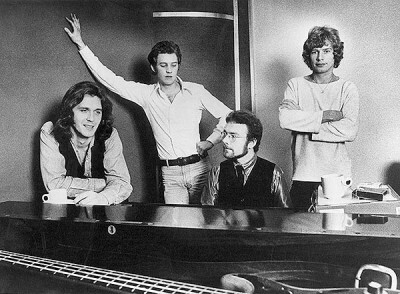 A more fortunate track worked on during the writing sessions was the Wetton-composed ballad section of what would later become Starless. Though it failed to make the recording, the band liked the title and used it to christen the improvisation which originally opened side two. Barely a month after finished work on SABB, the now fully-formed multi-sectioned Starless made its live debut. At the same time, another new song called Guts On My Side, which was itself based on some improvised lines driven by John Wetton, and can be seen and heard on the footage of Crimson playing at Central Park on June 25th 1973, when the band incongruously shared the bill with Black Oak Arkansas. Guts On My Side was, as far as we know, only ever played once in concert. For historical completeness, that single performance, captured on bootleg tape, is presented formally on CD for the first time.